To Cite: Rezaei O, Sharifi G, Ebrahimzadeh K, Hallajnejad M. Symptomatic Occlusion of Internal Carotid Artery Caused by Pituitary Macro Adenoma Among the Patients Without Apoplectic Signs; Case Report and Review of the Literature, Int J Cancer Manag. 2017 ; 10(3):e5301. doi: 10.5812/ijcp.5301. Introduction: Pituitary adenoma producing symptomatic carotid compression of the internal carotid artery without any apoplexy sign would be extremely rare and there was only one report regarding to this condition. Case Presentation: In this case report we have described a 57-year-old woman with a nonfunctional pituitary macro adenoma which has resulted to symptomatic internal carotid occlusion. Magnetic resonance imaging (MRI) revealed a large pituitary adenoma caused tight stenosis of right internal carotid. The patient has also experienced the transient ischemic attack which has confirmed to be the cause of internal carotid artery occlusion by this macro adenoma tumor. There was not any sign of apoplexy at the time of admission and the patient has not shown a history of pituitary adenoma. The patient then has undergone an endonasal transsphenoidal resection because of this nonfunctional pituitary adenoma. Conclusions: Pituitary macro adenoma producing symptomatic internal carotid occlusion might develop to several serious conditions including transient ischemic attack. Urgent surgical procedure might be the best approach to prevent further severe complications in such patients. Copyright © 2016, International Journal of Cancer Management. This is an open-access article distributed under the terms of the Creative Commons Attribution-NonCommercial 4.0 International License (http://creativecommons.org/licenses/by-nc/4.0/) which permits copy and redistribute the material just in noncommercial usages, provided the original work is properly cited. Pituitary adenoma (PA), a lesion arising from adenohypophysial cells, would be one of the most prevalent neuroendocrine intracranial tumors that accounted for 10% of all primary intracranial t111umors (1). Pituitary adenomas were usually benign lesions and less than 10 millimeters (mm). If they have grown to larger sizes they might result in compression with surrounding structures including cavernous sinus (2, 3). It has demonstrated that invasion of the cavernous sinus by tumors might lead to the compression and occlusion of the internal carotid artery (ICA) (4). The consequence of this event would be the presence of various clinical manifestations (4). On the other hand, the prevalence of pituitary adenomas has increased in the last few years (5). Some studies have also indicated the genetic predisposition of pituitary adenoma occurrence in individuals (6, 7). Despite huge pituitary tumors have reported as producer of stenosis or occlusion of the ICA, pituitary adenomas causing carotid compression of the ICA were rarely symptomatic (8-10). In addition, the incidence was extremely rare when there was no evidence of apoplectic event. To the best of our knowledge there was only one case report that has presented a patient with pituitary adenoma producing symptomatic carotid compression of the ICA without any apoplectic signs. In this case report we have described a 57 year old woman presenting with transient ischemic attacks (TIA) and a huge nonfunctional pituitary adenoma which produced symptomatic internal carotid occlusion. Patient has signed an informed consent for publishing data regarding her disease without her name divulged. A 57-year-old woman has referred to the neurology department of the Loghman Hakim hospital with complaints of sudden left hemiparesis involving her face and left extremities. She had an episode of transient hemiparesis one week before admission that lasts 12 hours. The patient has also suffered from disequilibrium, dizziness and vertigo. Physical examinations have revealed severe left hemiparesis [1/5]; mild left central facial paresis and bitemporal hemianopsis. Other neurologic examinations were normal. Patient's medical history was negative for cerebrovascular or cardiovascular diseases or other risk factors of stroke. She has declared no craniofacial trauma. Magnetic resonance imaging (MRI) has revealed two distinct findings: high signal abnormality indicating ischemic injury in periventricular white matter and a huge sellar-suprasellar mass that has encased both of internal carotid arteries. After Gadolinium injection the mass has become heterogeneously enhanced and the right internal carotid artery has appeared to be occluded (Figure 1). Color doppler ultrasound sonography (CDUS) of carotid arteries and vertebral arteries has shown high resistance monophasic wave form with no retrograde flow in diastole in proximal part of right ICA. There was no significant plaque formation. These findings have suggested the presence of either occlusion or severe stenosis of internal carotid artery in distal region of right ICA. Spiral computed tomography (CT) scan of brain has revealed an intra sellar mass 31 × 21 mm. CT scan findings of the other areas were normal. Electrocardiogram and echocardiography have demonstrated no arrhythmia, valvular abnormality or vegetation. Digital subtraction angiography (DSA) has confirmed the occlusion in right internal carotid artery (Figure 2). She had high level of prolactin (threefold of normal limit) in laboratory investigation and other hormones were within normal limits. “A” has shown left internal carotid artery angiogram, but “B” has shown right common carotid and internal and external carotid, and “C” has shown internal carotid artery. The patient has referred to our neurosurgery ward. She has undergone endonasal trans-sphenoidal surgery and the mass has resected. Sella has reconstructed as stage I according to Jalessi et al.’s (11) classification. Histopathologic examination has shown sheets of monomorphic polygona epithelial cells with amphophilic cytoplasms and round nuclei mostly in diffuse pattern with rare mitotic figures consistent with non-functional pituitary adenoma. No evidence of necrosis or hemorrhage has observed (Figure 1 A and B). She has shown an uncomplicated post operation course and has discharged 6 days after surgery. Hemiparesis has improved with physiotherapy and other rehabilitation techniques during six month follow up. Pituitary adenoma was the third most common intracranial neoplasms (12). Approximately 40 percent of all pituitary adenomas were macroadenomas which their growth might invade suprasellar area, cavernous sinus and sphenoid sinus. Internal carotid occlusion in cavernous sinus region has numerously reported in the setting of pituitary apoplexy (13, 14). In addition, several studies have indicated that pituitary adenoma is an important precursor of pituitary apoplexy (15-18). Although cases of carotid arteries occlusion due to other intracranial lesions such as tumors (19) and huge aneurysms (20) have reported, compression and occlusion of ICA with pituitary adenoma were very rare especially in cases without apoplectic evidence. Molitch et al. (8) has evaluated the rate of internal carotid artery occlusion caused by pituitary adenomas. In their study 141 patients with cavernous sinus invasion have caused by different types of tumor have investigated. Eighty three patients had carotid artery encasement with 58 cases of them having pituitary adenoma. They have found that only one out of 58 cases (1.7%) has developed compression of the artery. This result has shown that pituitary adenoma producing internal carotid artery occlusion was extremely rare. In literature review we have found five case reports describing pituitary tumors producing carotid artery occlusion without the presence of apoplectic events (10, 21-24). Table 1 has summarized the details of these reports. The microscopic or endoscopic transsphenoidal surgery has emerged as the appropriate approach in cases with pituitary adenoma. In our case report the patient has presented with TIA without the evidence of apoplexy. 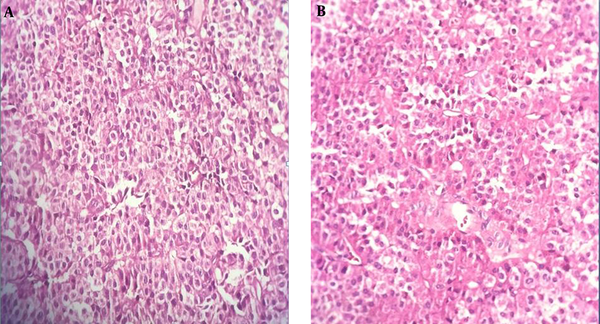 Histopathologic findings has indicated that the tumor was a nonfunctional pituitary adenoma with no intra tumoral hemorrhage and no necrosis which was in consistent with lack of the apoplectic signs. Angiography in this case has confirmed the occlusion in right internal carotid artery that appears to be due to direct compression effect of the mass. Rey-Dios et al. (23) has reported a 48-year-old patient with right-hand weakness, left hemiparesis and blurred speech. He has experienced TIA which led to stroke. 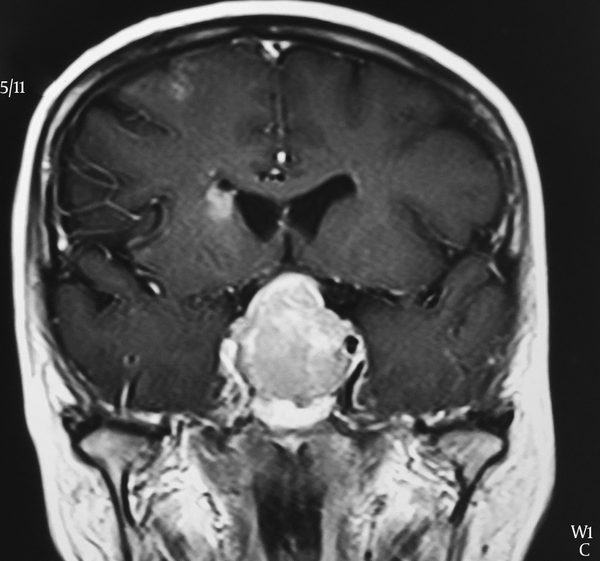 Further evaluation and MRI have revealed a huge pituitary adenoma causing direct compression and occlusion of the left ICA and excessive stenosis of the right ICA. Similar to our result there was no sign of apoplexy in this case. In the study by Spallone (10) three cases with internal carotid artery occlusion by intracranial tumors have reported. Two had meningioma and the other one had pituitary adenoma. The occlusion has confirmed with carotid angiography in all cases. Pituitary adenomas causing symptomatic carotid compression of the ICA without any apoplexy event would be extremely rare. However, it might cause several clinical manifestations including TIA or stroke. If other causes for ischemic event have ruled out, urgent surgical procedure would be the best approach to prevent further complication in such patients. The authors would like to thank clinical research development center of Loghman Hakim hospital for technical assistance.